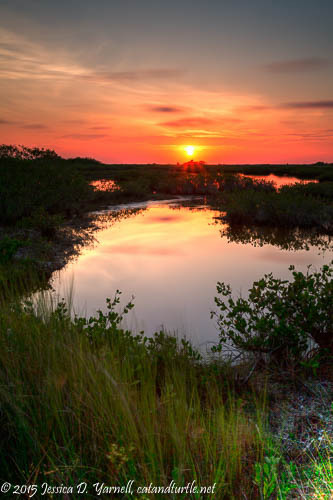 I visited Merritt Island National Wildlife Refuge this past weekend. 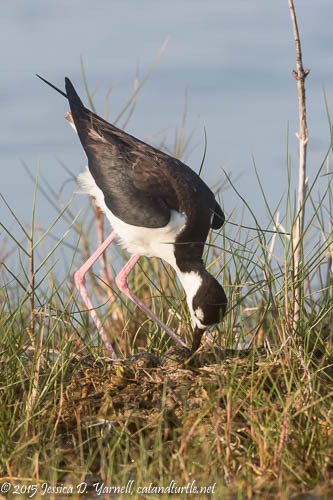 It’s Black-necked Stilt nesting time! There were so many nests. Pintail Heaven in the wintertime turns into the stilt nursery in the summer. Many expectant parents were on eggs. This mom posed nicely for the camera. I was able to spot four brown eggs in her nest as she stood to turn them. Then she bent those long legs to settle herself back down on the eggs. Some stilt nests are just small mounds of dirt surrounded by water, like the one above. I watched this mom for a while and hoped for her that we don’t get a good rain before her eggs hatch and her chicks are mobile. Other stilts make their nests at the edges of mangrove “islands.” These provide more flexibility to move the eggs higher in bad weather. But they are more subject to predation. I watched the pair above during their “change of the guard.” One adult was on the nest, then the other flew in to take over incubation duties. They met in the water and exchanged what looked like a kiss, although I guess it’d be better described as an attempt to bite each others’ beaks and necks. Then the incoming parent settled in on the nest while the other one flew off to stretch his/her wings. I bet that felt good! The other fun birds on the refuge that evening were the Little Blue Herons. As the juvenile birds morph into their adult plumage, their feathers acquire a “calico” appearance. 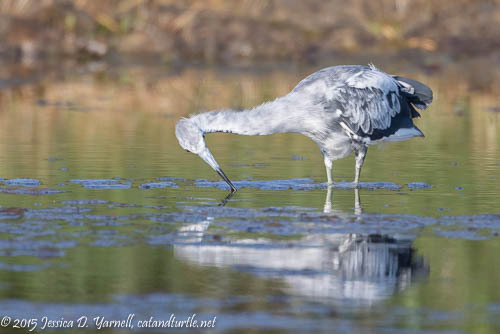 This “calico” bird was very intent on fishing in the water. I loved his expression here as he craned his neck to see his prey. As the sun fell lower in the sky, I found my planned sunset location. The few clouds in the sky reflected in the water. I experimented with both a 10 stop and a 3 stop ND filter to blur the windy water and capture some motion in the clouds. This was a 60-second exposure. 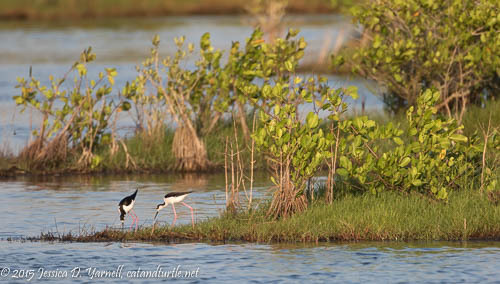 Just love the black-necked stilts … so fragile looking and quick. Beautiful shots here Jess! Such delicate creatures. 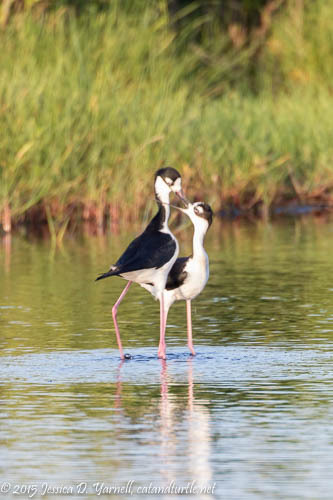 Wonderful series of nesting stilts! Terrific sunset shot! The long exposure combined with your filter produced a really nice effect!